July 30, 2011 — I think the gender equality movement has gone about it the wrong way in their quest for fair recognition for women in the workplace. To break the glass ceiling, they didn’t need to educate against bias or unite for the cause. They just needed a taller woman. Like Sylvia Hardy, the Maine Giantess. This eight-foot-tall woman would’ve broken any ceiling, glass, plaster, or mirrored. Born in 1824 in Wilton, Maine, a small town about 70 miles due north of Portland, Hardy was half of pair of twins who each weighed three and half pounds at birth. Her brother died, but Hardy lived up to the family surname, and then continued to live up and up and up until she had to stoop down to get through doorways, use whiskey glasses as thimbles, and put up with nonsense like people saying she used whiskey glasses as thimbles. Her gigantism didn’t kick in until she was a teenager, but from then she kept growing until she was 40 years old. 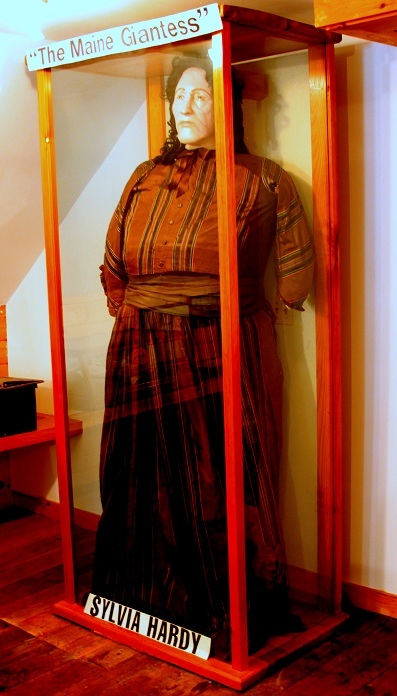 As a result, various newspaper reports of the era peg her at heights that range from 6’8” to 7’10” depending on the year, with her weight ranging from 330 pounds to more than 400 at her death. Of course, since this is the 1800s and we’re talking about human oddity, P.T. Barnum makes a cameo in this story. Barnum took that brick house of a woman and made her a part of his traveling show, as well as a feature of his American Museum in New York. Hardy worked with Barnum for more than a decade, touted in Barnum’s usually hyperbole as the tallest woman in the world. Stories about her, like this one, never fail to mention that she was steadfast friends with the famous dwarf performer General Tom Thumb and his wife. Hardy died in 1888 at the age of 65. 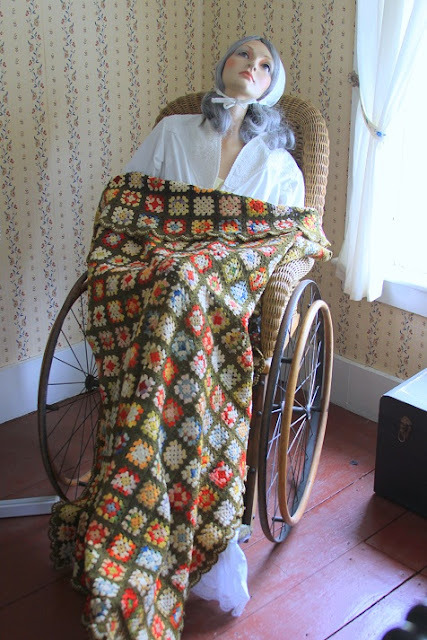 Today, Wilton celebrates their biggest attraction with an exhibit of her personal effects and a life-sized replica of her in the town museum, as well as a plaque on her grave. 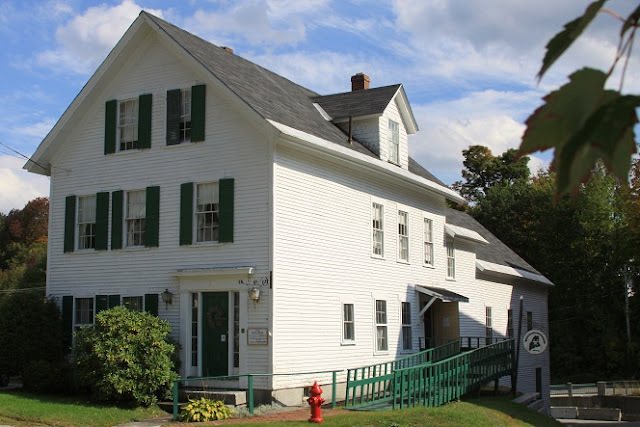 The exhibit can be found on the top floor of the Wilton Farm and Home Museum, a 150-year-old ex-dormitory for the Bass shoe company, which started in Wilton. Located at 10 Canal Street, the four floors of the museum are filled with all the snakeskins that a 200-year-old town sloughs over the course of its existence. The place is large, but is filled with all sorts of furniture and equipment, photographs and war memorabilia, old toys and various miscellaneous personal collections. The museum is only open from 1 to 4 pm on Saturdays during the months of July and August. However, they’re willing to make special appointments for the interested, and kindly did so for us, even though they saw right through the façade that we were there for the history of Wilton and not just for the gigantic papier-mâché and plastic woman upstairs. She’s located in a large attic space called the Academy Room, which is filled with mementos from the town’s historic Wilton Academy. 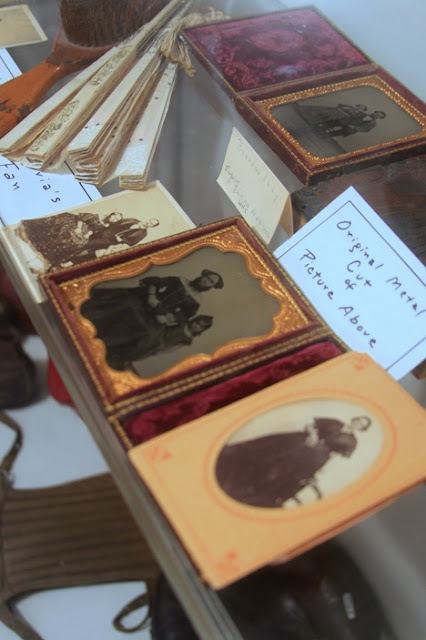 Among all the books and furniture and photographs and signs, is a small display case filled with artifacts from Hardy’s life, a paper fan, a hair brush, pictures of her and her fellow sideshow performers, newspaper articles. 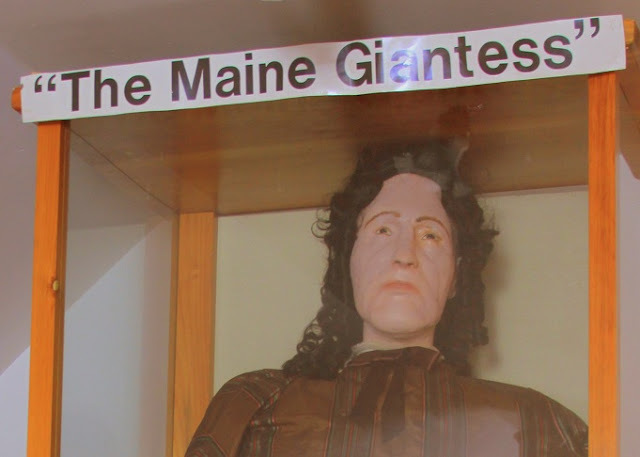 And towering over that horizontal glass display case is a custom-made vertical one containing the pièce de résistance of the Wilton Farm and Home Museum collection, a full-sized replica of the Maine Giantess. Bearing a pretty good likeness of the gigantrix's somatomegaly-influenced features, the model is accurate in both height and girth. In fact, it’s wearing one of Hardy’s actual dresses, a gown that measures some 6’8” tall itself. If you want to use my pic at the top of the article for a size reference, I run just over six feet on a good day. 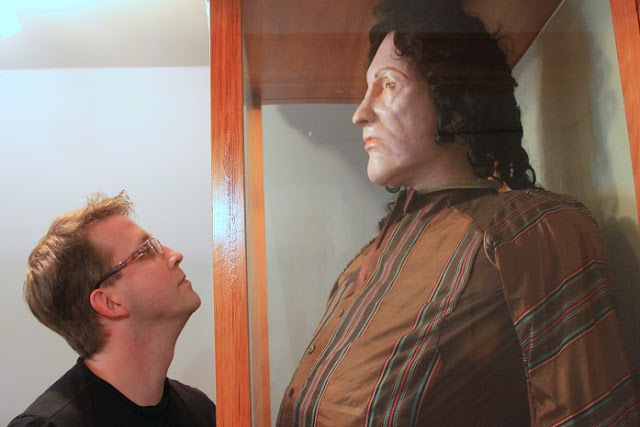 And standing face to bosom with a replica giant is a good day. 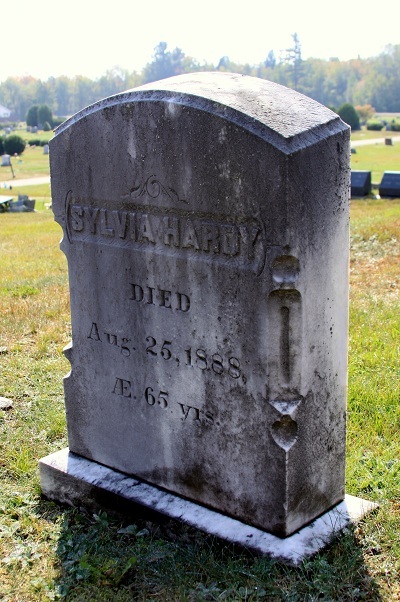 To see the grass that the real Sylvia Hardy has become, you’ve got to drive over to Lakeside Cemetery on the other side of Wilson Pond, less than a mile from the museum. Lakeside has two different entrances, one on Lake Street, and the other on the far side of the cemetery at Rt. 2. Finding Hardy’s grave isn’t too difficult, since the graveyard isn’t large. It’s also open and treeless, so any given spot pretty much gives you a vantage of the whole place. Her grave is located closer to the Lake Street entrance, in the older part of the cemetery, on your right if you’ve entered from that direction. Hardy was buried in a massive eight-foot-long casket, probably about the size of her model’s display case back at the museum. She’s buried adjacent to her mother, who died just two weeks after her colossal daughter. Hardy’s grave merely gives her death date and her age, but in 1985, Wilton residents installed a plaque on the ground that lets visitors know just how much earth is being displaced beneath their feet. To be remembered after you die, you have to leave as big an impression as possible. When you’re a giant like Sylvia Hardy, you kind of do that naturally. Pic has nothing to do with Sylvia Hardy. Just wanted to warn you that this thing is in the museum.